Complete system consisting of a compressor and an incorporated sealant cartridge which permits temporary repair of the tyre so that you can drive to the nearest garage. The kit is mounted in the boot under the fl oor. This repair kit is available from CITROËN dealers. It is designed to repair holes of a maximum diameter of 6 mm, only where the puncture is located on the tyre tread or shoulder. Avoid removing any foreign bodies which have penetrated the tyre. 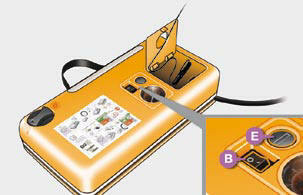 This procedure, comprising several steps, must be carried out in full. Turn the selector A to the "SEALANT" position. Check that the switch B is in position "0" . Connect the white pipe C to the valve of the tyre to be repaired. Connect the compressor's electric plug to the vehicle's 12 V socket. Affi x the speed limitation sticker to the vehicle's steering wheel to remind you that a wheel is in temporary use. Start the vehicle and leave the engine running. 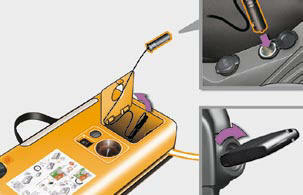 Switch on the compressor by moving the switch B to position "1" until the tyre pressure reaches 2.5 bars. Remove the kit, taking care to avoid to avoid staining your vehicle with traces of fl uid. Keep the kit to hand. Drive immediately for approximately three miles (fi ve kilometres), at reduced speed (between 15 and 35 mph [20 and 60 km/h]), to plug the puncture. Stop to check the repair and the tyre pressure using the kit. Turn the selector A to the AIR position. Connect the black pipe D to the valve of the wheel. If after around 5 to 7 minutes the pressure is not attained, this indicates that the tyre is not repairable; contact a CITROËN dealer for assistance. 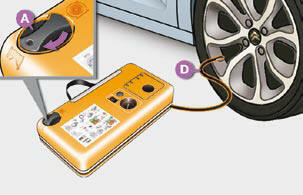 You can also use this kit for the routine check and adjustment of the tyre pressures on your vehicle. For this, carry out just the following 6 points. Start the vehicle again and leave the engine running. 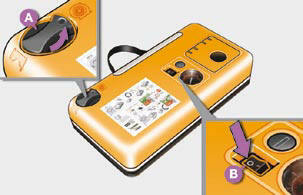 Adjust the pressure using the compressor (to infl ate: switch B in position "1" ; to defl ate: switch B in position "0" and press button E ), in accordance with the vehicle's tyre pressure label (located on the left hand door aperture). 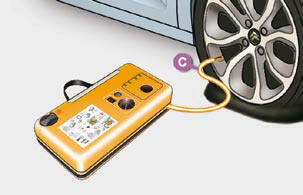 A loss of pressure indicates that the puncture has not been fully plugged; contact a CITROËN dealer for assistance. 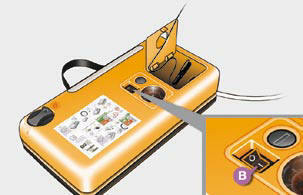 Remove and stow the kit. 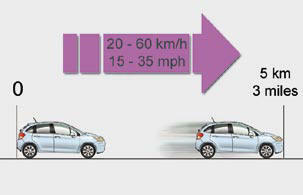 Drive at reduced speed (50 mph [80 km/h] max) limiting the distance travelled to approximately 120 miles (200 km). Go to a CITROËN dealer as soon as a possible. Have the tyre inspected by a technician, who can then advise you whether it can be repaired or should be replaced. Take care, the fl uid contains ethylene-glycol. This product is harmful if swallowed and causes irritation to the eyes. Keep it out of reach of children. The expiry date of the fl uid is indicated on the cartridge. 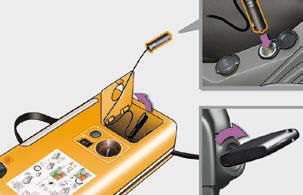 The sealant cartridge is designed for single use; even if only partly used, it must be replaced. To remove the cartridge, turn it a quarter turn at its cap and pull off. After use, do not discard the cartridge into the environment, take it to an authorised waste disposal site or a CITROËN dealer. 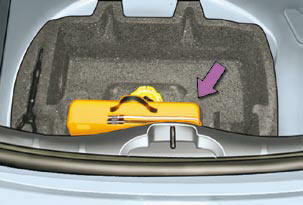 Do not forget to obtain a new sealant cartridge, available from CITROËN dealers.